I mentioned in the previous post that Spanish Prime Minister Mariano Rajoy had only made his comments about Scottish membership of the EU as a quid pro quo for Davie Cameron returning the favour and making a similar comment which Mariano could use to pour ice cold gazpacho over Catalan aspirations to independence. And lo verily it has come to pass. Within a couple of days Cameron sort of said something which Rajoy could use to slap down Barcelona with a smug grin on his beardie face. It wasn’t much of a statement on Cameron’s part, but with the serial crises Spain and the Partido Popular are facing Mariano doesn’t get to look smug very often and has to work with the limited material he has to hand. On Friday evening the unionista media in Spain (which like the media in the UK is pretty much most of it) El Mundo was crowing that Rajoy y Cameron advierten a Escocia y Cataluña de su expulsión de la UE si se independizan ‘Rajoy and Cameron warn Scotland and Catalonia of their expulsion from the EU if they become independent’. Meanwhile El País gushed that Rajoy y Cameron coordinan la respuesta al independentismo de Cataluña y Escocia ‘Rajoy and Cameron coordinate the response to Catalonia and Scotland’s independence campaigns’. El Mundo’s report is as good as any. El Mundo is yer typical right wing Spanish newspaper, like the Daily Express but without the fixation on Princess Di. It tells us that Cameron and Rajoy took advantage of the European summit in the Lithuanian capital Vilnius to have a conversation, during which Cameron agreed with Rajoy that new countries aren’t a part of the EU. It wasn’t exactly a formal meeting of the forces of anti-independence resulting in the issue of a joint communiqué, it was more a wee chat for a couple of minutes over the coffee machine. Mediated by interpreters of course, because Cameron speaks no Spanish and Rajoy’s English is atrocious. If you’ve ever dealt with interpreters, or worked as one, that cuts conversation time down by about a half because everything has to be said twice. So it was a wee chat for half of a couple of minutes over the coffee machine. Cameron issued no statement, we only have Rajoy’s words on the matter, and they were hedged about with the caveat that himself and Cammie were speaking in general terms, not about any recalcitrant rupturistas in particular. It’s hardly surprising Cameron made no direct mention of Catalonia. He’s not keen on getting involved in independence debates in case he gets mauled by Nicola Sturgeon. He spends most of his time trying to make out that the Scottish independence debate has nothing to do with him, so at least he’s being consistent for once. But it was enough to give Rajoy what he needed in order to present Madrid’s obstinate refusal to recognise the Catalans’ right to self-determination as a European consensus. In an eerie mirror image of Scottish coverage of Rajoy’s non-news earlier this week, Cameron’s non-statement was sprayed all over the Spanish media like Cameron had said something new, while it scarcely figured in the Scottish news at all. Because everyone in Scotland knows that Cameron has been spouting the same guff for quite a while. It should be clear by now to anyone following the debate that Cameron and Rajoy are blindly applying the existing rules for external candidate states, which are already independent, to a state which is applying for EU membership from within the EU and already in full compliance with EU membership criteria – prior to its formal declaration of independence. This is an entirely novel set of circumstances which the EU has never faced before, and in the absence of a formal ruling from the EU on the subject Cameron and Rajoy are merely expressing a fond wish on their own part. That would be the wish that the campaigns for Scottish and Catalan independence would just shut up and go away. Of course, Cameron or Rajoy could get the EU to make a formal ruling which would leave the answer in no doubt, but both refuse to do this. Governments of existing EU member states are the only bodies able to make a formal request to the EU for such a ruling. If they’re so confident of their position, why don’t they get it formally confirmed? In fact Spanish Unionists are so eager to avoid any discussion of Scottish or Catalan independence at an EU level that the Spanish opposition party the PSOE blocked a debate in the European Parliament on Scottish membership. The debate had been proposed by Scottish Labour MEP David Martin who was hoping that it might produce some soundbites helpful to the Better Together cause. Spain however, fears that any such debate might reveal the degree of support which exists in Europe for Scottish membership, which is not inconsiderable, and that would not help to discourage the Catalans. Likewise both Cameron and Rajoy fear that if they were to ask the EU for a formal ruling on Scottish or Catalan entry, the answer would most likely be along the lines of We can work it out, life is very short and there’s no tiiiiiime for fussing and fighting my friend. The Partido Popular make no secret of their desire to forge a European wide alliance of right wing groups opposed to autonomy or independence campaigns, and have had a number of meetings with the British Conservatives in pursuit of this goal. They do this as they repeatedly claim that the cases of Scotland and Catalonia cannot be compared and are not remotely similar – except when it comes to plotting to stop them acheiving independence. Spanish for hypocrisy is hipocresía, in case you were wondering. There have been a series of talks between representatives of the Partido Popular and the British Conservatives to develop a “common response” to independence movements. Talks between the parties have been held on a number of occasions. Scottish Tory leader Ruth Davidson was reportedly an attendee. Following a meeting in 2012, the Partido Popular’s Esteban González Pons announced to the Spanish press that his party had reached an agreement with the Conservatives to present a joint response to Scotland and Catalonia. González Pons also claimed that in December 2012 he was meeting in Edinburgh with leading members of the Scottish Conservatives and the Labour party in order to pursue collaboration further. No answers on this meeting were ever forthcoming. The Conservatives vehemently denied that they made any agreements with the Partido Popular to work jointly against Scottish and Catalan independence. Despite this they continue to meet with González Pons and the Partido Popular, most recently at the Conservative party conference this year. The Scottish Tories could not possibly admit to the existence of an agreement between themselves and the Partido Popular to prevent an independent Scotland acceding to the EU. It’s because there’s a word for secretly conspiring with a foreign political party to damage your own national interest if a democratic vote doesn’t go according to your liking. If news of such agreement got out, it would spell the death of the No campaign. For that reason alone, I believe the protestations of the Tories that there is no formal agreement. What there probably is however, is an informal understanding that the Conservatives and the Partido Popular will collaborate in ways which do not damage their domestic positions. And that means making vague statements on generalities at suitable times in each other’s version of Project Fear, like just after the launch of the Scottish White Paper on Independence. But it’s all smoke and mirrors, vested interests pretending to be neutral voices of authority in someone else’s debate, repeating old scare stories like they were news. The Catalans will treat Cameron’s comments with the disdain Rajoy’s received in Scotland. In “breaking news” during a dull ding dong of a debate on Newsnicht on Wednesday evening, we were breathlessly told that Spanish Prime Minister (Prime Minister right, so he must be someone really important) Mariano Rajoy had made an important intervention in the debate about whether Scotland should keep paying for railway lines between London and Birmingham, weapons of mass destruction, and Ian Davidson’s expenses. We really require a drum roll at this juncture, or possibly a mariachi band – yes I know that’s a Mexican thing but are you telling me BBC Scotland would know the difference? – in a major new development Mariano Rajoy said … what he’s been saying for the past 18 months or so. Nada nuevo. Jackie Bird could have done a salsa to it, while Gordon Brewer practised imperious looks in preparation for his tango with Johann Lamont, but it would still have meant “nuhin new”. What Rajoy said was that new countries would be outside the EU. He’s been saying this for quite a while now, he regularly trots it out as a threat against Catalan independentistas. It was of course covered in the Spanish media, although it came way below stories about Rajoy’s unwillingness to explain how he’s been managing his party’s finances after a series of corruption scandals enveloped the Partido Popular. La Moncloa, the seat of Spain’s government, is not in a happy place. Not much new there either. What would have been more interesting, and you know, would have made this news as opposed to a bit of mutual backscratching between anti-independentistas, would have been if Mariano had said “Spain would veto an independent Scotland’s entry into the EU and cancel flights between Prestwick and Malaga.” Which if nothing else would at least make him popular with people who hate Ryanair. But he didn’t say that. Rajoy’s the Spanish PM, he and his cabinet of obsessive centralistas madrileños decide Spain’s foreign policy. If he wanted to send a clear signal that Scotland would have a tough time getting into the EU, he could have said so. But he didn’t say that either. Here’s what he did say, in both the original Spanish and my English translation, as quoted in El Pais newspaper. The El País article which the quote came from is entitled Rajoy usa Escocia para lanzar un aviso a Cataluña ‘Rajoy uses Scotland to launch a warning to Catalonia’. Rajoy’s comment was not aimed at Edinburgh, but at Barcelona. He was reminding them that Madrid has furren pals tae gie it hauners. What he was doing was sending a wee quid pro quo to Davie Cameron, because Westminster will share the quid with Spain but not Scotland, so Davie would say something helpful in Mariano’s Proyecto Miedo against the Catalans. Like threatening to slap an extra tax on charter flights to Sitges or reopening El Bulli for Bullington Club reunion dinners. The whole thing about it not being new and not being directed at Scotland must have got lost in translation. There’s a BetterTogether filter on all news reports from Spain, nothing which doesn’t support the scare story du jour gets through. Besides, “Here’s something someone said nearly two years ago” lacks the sense of urgency which is a vital component of any warning of impending doom. Despite the bluster, Madrid is not going to issue a statement saying that Spain will veto Scottish membership of the EU. It’s a bit like the argument over whether an independent Scotland would retain the pound. You get a lot of “Oooh missus! How very dare you!” from Westminster, but they don’t actually rule it out because Westminster knows that it’s in the interests of the rUK to agree to a currency union after a Yes vote. Spain knows it’s in Spanish interests to agree to Scottish membership of the EU after a Yes vote. There are many reasons Spain knows it’s in Spanish interests to welcome Scotland into the EU. None of which can be voiced before a Yes vote, for reasons of both international and domestic politics. Rajoy is hardly likely to admit to them before the referendum. Scotland would be a net contributor to EU funds, which a Madrid with an eye on EU budgets will certainly have considered. Spain is a net recipient of EU funding, and all those agricultural subsidies and investment in infrastructure for poorer regions depends on a healthy EU balance sheet. That’s not been doing too well of late, and the bottom line is that people short of dosh don’t deprive themselves of potential creditors. We also provide access to fishing grounds that provide employment to the culturally and economically important Galician fishing industry, Mariano’s home region. If you’ve ever seen a fish counter in a Spanish supermarket you’ll know what a very big deal seafood is. Then there’s a whole trawlerful of other reasons, like our energy resources, the importance of political stability during a time of economic crisis in the eurozone, and enough Realpolitik to satisfy Angela Merkel at her sternest. Perhaps most importantly, Scotland will not be the permanent obstacle to EU agreement posed by the rUK. The political geography of the EU is changed, the rUK is no longer a state on the periphery, it will be surrounded by EU members. That increases the incentive for the rUK to be more collaborative in European initiatives. And finally there’s the not unimportant consideration that the average Spanish person, doubtless including Mariano Rajoy, does not bear Scotland any ill-will. Quite the reverse actually, there is a surprising amount of affection for Scotland in Spain. Even the most fervent opponent of Catalan independence or nationhood will cheerfully point to Scotland as an example of “a nation”. But the important point in terms of Spanish domestic politics – which is all that interests Rajoy – is that Spain does not need to veto Scottish membership of the EU in order to send a signal to the Catalans. Neither does it need to do so in order to block Catalan accession to the EU. Madrid’s case for refusing to recognise an independent Catalonia rests upon grounds which are not applicable to Scotland. The constant and repeated line from la Moncloa is that Scotland has a constitutional right to hold an independence referendum, Catalonia does not. Scottish independence will be negotiated and agreed with Westminster, and will be recognised by Westminster. Members of the Spanish government have said repeatedly that under such circumstances Spain could have no grounds for objection. In the event of Scottish independence Madrid will recognise Scotland while at the same time stating that its reasons for recognising Scotland are precisely the same reasons why it cannot recognise an independent Catalonia. They will also protest, without the slightest shred of shame, that they’re not being hypocritical. La Moncloa already has the only legalist reason it requires to block Catalan independence and international recognition, it doesn’t need to damage its relationship with an independent Scotland in order to prove a rhetorical point it’s not actually making. That’s Realpolitik in a modern Europe. Even Rajoy’s statement that an independent Scotland would automatically be outside the EU does not imply that Spain would ensure that Scotland’s negotiations to join the EU would be protracted. But it’s in the current interests of Madrid to imply that they would be. There have been no independence referendums yet, so both la Moncloa and Westminster want to make out that Scottish or Catalan accession to the EU is more horrendously complex than assembling flat pack furniture with only three screws, the wrong sized Allen key, and a plastic spoon. The point of EU negotiations should be easy to understand, even for leader writers in the Scotsman. Apart from the obvious goal of EU membership, what are EU membership negotiations for? They are to ensure that applicant countries are in accord with EU standards on a whole raft of issues, from democratic government, human rights, press freedom, the economy, the environment, and a whole lot more besides. The negotiations are extremely lengthy and complex because it takes time for a country to ensure compliance on environmental protection standards for newts, and regulations on the minimum number of newspapers willing to publish made up stories about EU banana regulations. This is what takes years to sort out. Scotland’s already done all that though, having to do it all over again would be like having to surrender your driving licence in order to use public transport. Scotland already possesses a valid EU driving licence, we don’t suddenly forget how to drive because we’re taking the independence bus. What Scotland needs therefore, is not to have to take its EU tests all over again, with all the frantic swotting and overdosing on RedBull that would entail, what we need is for our licence to be validated. That’s a political decision, and one which will only be revealed after a Yes vote has taken place, because in the current political landscape it’s in the interests of both the Moncloa and Westminster to pretend they might do otherwise. Confronted with the reality of a Yes vote, both will do what is in their national interests under changed circumstances. And that means Westminster will agree to a sterling union and Moncloa will agree to Scotland in the European Union. Still trying to read through the 600 odd pages of the White Paper on independence, which you can download fae here http://www.scotland.gov.uk/Publications/2013/11/9348 if you haven’t already done so. I’m a fast reader, but am still only halfway through, and still have not had time to mull it over and digest the bits I’ve read so far. That must be why I’m just a punter and not a punching above their weight Unionist politician like Alistair Darling, who seemingly not only had read the document, he’d digested it and was crapping it all out in wee pieces on telly interviews throughout Tuesday. Since he was doing this on the Beeb within two nanoseconds of the White Paper’s publication, he’s either the world’s fastest reader or he’d swallowed a ton of laxatives and some Better Together briefing notes. Anyway, it was a bit of a strain, what with one eye on the white paper and one ear on Alistair’s bowel movements, but it was something about childcare and how we couldn’t possibly pay for it, although simultaneously he wanted to know why the Scottish government wasn’t paying for it right now. It was enough to gather that he had about as much knowledge of the contents of the White Paper as the average badger has of Westminster’s plans for future devolution. Which is actually somewhat more than Alistair does, come to think of it. Still at least he must feel reassured that despite being 670 pages long, and detailing the possibilities for an independent Scotland in the economy, culture, health, equality, security and development, goes into the nitty gritty of Scotland’s agricultural potential, and nowhere once does it mention the words badger cull. Of course I’m not the immense expert in the contents of the White Paper that Alistair is, what with his Olympic medal for speed reading and brain the size of a soundbite, but I seem to recall somewhere in the mass of pages an explanation that the proposed child care costs would be met by increased tax revenues generated by the greater participation of parents in the workforce – but that under current arrangements the extra revenues disappear into George Osborne’s maws, to be spent on something beneficial to Scotland like a London sewer upgrade. Even I managed to pick up on that, and unlike Alistair I’m not paid to pay attention. It all summed up what, for me, is the real reason for Scottish independence. We’d have a government made up of people who are paying attention, and if they don’t pay attention we can vote them out. It shouldn’t be a lot to ask for in a democracy, but if Alistair is anything to go by we’ll only get it with a Yes vote. The Union gives us a political class which is paid not to pay attention, and no matter what we do can never be got rid of. They can hardly complain that we no longer pay attention to their warnings that we’ll be doomed if we ditch them. At least the BBC was paying attention to Scotland’s independence debate in its own inimitable way. We got the wise and insightful words of its national commentators on the UK news, helpfully telling us benighted Scots who’ve been having this debate off and on for decades what it’s really about because we’re too provincial to work it out for ourselves. Nick Robinson seemed quite let down by the lack of any razzamatazz or pandas in kilts giving a Buzby Berkley style aquatic performance in Bellshill swimming pool. He’s been to the birth of quite a few new nations, he said (or maybe he didn’t because I wasn’t really paying attention), and this just didn’t feel like one on account of a distinct lack of marching bands, Weegie fireworks that look like penises, and exhibitions of raffia based ethnic crafts. Of course he was spectacularly missing the point. Scottish independence is not about a new nation. Scotland is not a new nation. We’re a very old nation. We’ve got the national identity thing well sorted already thanks. Identity? Got it by the bucketload ta. In fact the very opening words in the preamble to the White Paper are “Scotland is an ancient nation.” Nick’s not really been paying attention either. The White Paper shows us how we can start to find solutions to our problems and take advantage of our opportunities in ways that are not dictated to us by people who aren’t really paying attention. That makes it far more exciting and substantial than the Union flag bedecked parades that pass for Westminster’s attempts to imbue us with British pride. But why should he have been paying attention anyway? He’s the BBC’s Westminster correspondent. Scotland is irrelevant at Westminster and always has been. Neither the Tories nor Labour require Scottish votes in order to form a majority government. They have no need to pay attention. Scottish independence is about how Scotland governs itself and deals with the challenges and opportunities that face any small northern European nation. Independence is the radical notion that if Scotland was governed by people who were obliged to focus their attention on Scotland, they just might discover a more palatable way of doing things than the increasingly bitter range of options tossed at us by Westminster. The release of the White Paper signals the real start of the referendum campaign. The aim of Project Fear has been to destroy the credibility of the Yes campaign before the White Paper was released, the White Paper could then be safely ignored. But they’ve failed. They have not pushed polling intentions for No into the overwhelming figures which are required this far out from the vote to ensure a No result. Despite a full on barrage from the combined weight of the mainstream media, the Yes vote has not only held firm, it has increasingly reduced the gap. The latest poll puts Yes on 38% and No on 47%. A 9% swing would see a Yes. A few weeks back, Johann Lamont compared support for independence to the outbreak of a virus. There was the usual denunciation from those in the Yes campaign with a contractual obligation to be po-faced, whereas other independentistas responded by declaring themselves Yes Positive adopting the tried and tested method of taking your opponents insults and throwing them back in their faces. I’m a big fan of this. It’s a tactic that has served the gay community very well. This in turn prompted others to complain that adopting a Yes+ slogan was insensitive to gay people, what with certain more life threatening conditions being normally associated with +positive diagnosis, such as BetterTogether’s lamentable joke of a +case for the Union. It all quickly grew into one of those typically Scottish arguments about who was more upset on someone else’s behalf, before Reporting Scotland could find a story about a cute wee kitten that could play shinty. About 15 minutes, in other words. But Johann had actually hit on something, in an entirely unintentional way. A virus spreads by contagion, and so does supporting independence. Once No voters or undecideds come into contact with the arguments for Yes, they tend to switch sides. The mere fact of engaging with the arguments produces Yes voters. Hope is contagious, it’s an attractant force. So how attractive does hope have to be in order to be certain of a Yes vote in September next year? Not very attractive at all, is the surprising answer. Let’s suppose that for every 200 Yes voters, every week one of them succeeds in converting a don’t know or a No to a Yes vote. That’s really not very many at all, it means that neither you nor most of the Yes voters you know are likely to convert anyone to a Yes vote between now and September next year. What sort of outcome would that “contagion rate” produce? Let’s do some fantasy statistics. As always in such thought experiments you need to follow the golden rule: where there is room for any uncertainty or doubt, you give the hypothesis you don’t favour the benefit. In this case that’s a No outcome. We don’t want that all all, oh no. So we deliberately weigh things in favour of a No outcome. It may seem counter-intuitive, but by doing this we ensure that if we get the result we want, a Yes outcome whoo-hoo!, then we can be more confident in the prediction. But this isn’t even a prediction, it’s more an attempt to guage the scale of the task ahead, and to gain an idea of whether it’s a real possibility. The latest opinion poll is as good enough as any to use for some baseline figures, Yes is on 38%, No on 47%, with 15% undecideds. There approximately 4 million voters on the Scottish electoral register. Extrapolating from this poll (and ignoring things like likelihood to vote) there are currently 1,520,000 Yes voters, 1,880,000 No voters, and 600,000 undecideds. In order to keep things simple, we’ll assume that the 600,000 undecideds represent those who will not vote – in other words we’re assuming the turnout will be the very high figure of 85%. That in turn means that 3,400,000 people will vote, so 1,700,001 votes are required in order to produce victory. It’s received wisdom that a high turnout favours the Yes vote. The reasoning is simple, if you cannae be airsed enough to vote in normal elections, you’re hardly likely to be airsed enough to vote to keep a system you cannae be airsed about. So let’s not assume that, instead we’ll ignore it and imagine that a high turnout is equally likely to benefit No as it is Yes, the Yes vote gains no advantage from it. This gives the No hypothesis the benefit of the doubt, and saves making the sums more complicated. If each week the existing body of Yes voters is able to attract one new supporter for every existing 200 Yes voters, it’s equivalent to a weekly interest rate of 0.5% – considerably lower than a payday loan company at over 1% per day, and illustrating just how an independent Scotland will prove to be excellent value for money where less people need the likes of Wonga. But in this case, what we mean is the rate at which we get people interested in independence – it’s really a measure of the contagion rate of hope. Using the figure of 0.5%, the first week sees an increase of 7600 in the total number of Yes supporters, the second an increase of 7638 because there are now slightly more Yes supporters able to spread the contagion of hope. 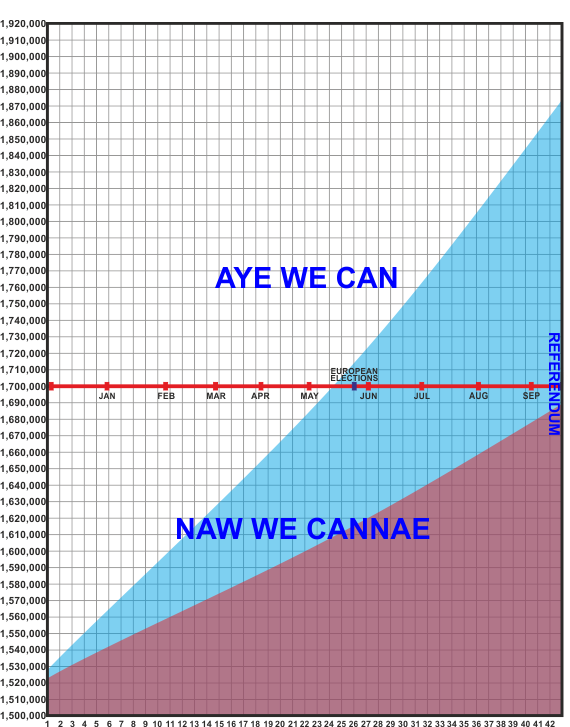 And if we keep campaigning and keep changing minds at the same rate, shortly before the European elections in May next year the Yes vote overtakes the No vote, and continues growing to reach 1,874,329. On our turnout of 85%, that gives a Yes vote of 55.13%. It’s the upper line on the annoyingly blurred graph. * The red line along the middle represents the threshold required to reach a Yes outcome. However, and here’s where it gets really interesting. Let’s suppose that the contagion of hope isn’t even that attractive. Perhaps it’s half as attractive. Yes supporters are only able to rustle up one new supporter every week for every 400 existing Yes voters. That’s an interest rate of a mere 0.25% a week, which would scarcely keep Wonga in cute puppets to use as merchandising tools. The Yes vote grows more slowly of course, but by the fateful day on 18 September 2014, it reaches 1,688,063, a Yes vote of a tantalising 49.65%, just 23,874 votes behind No on 50.15%. This is the lower line in the graph. It’s not a Yes, but it is an outcome that ensures that the issue of independence will not be put on the shelf for another generation. Remember that we’ve already made a lot of assumptions that favour the No vote. It’s more than likely that these outweigh the narrow gap between Yes and No which an “interest rate” of 0.25% per week produces, and such a rate would in fact produce a Yes vote. The No campaign has worked all this out too. They also know that while they dominate an increasingly discredited mainstream media, the Yes campaign has the campaigners on the ground and in the social media. Achieving these rather derisory interest rates is very much within the grasp of the Yes campaign. That’s why Project Fear is so fearful. Today the Scottish Government releases its prospectus for hope. Better Together will of course launch into its usual saturation media bombing campaign of smear and fear, but it’s already too late. *I’ll replace the graph with a larger and clearer one sometime later today. Here we go again, another day, another scare, each one dumber than the last. It’s safe to say that Project Fear is now bricking itself. The anti-independence campaign which began with the intent of progressing as calmly and gracefully as a swan gliding across the glassy smooth waters of the garden pond of Scotland’s media is now more like the famous Norwegian Blue parrot sketch. The latest impossibility to occur in the increasingly improbable list of implausibilities from Project Fear is that even if we do vote Yes, we can’t become independent until Westminster is jolly well good and ready. The Guardian has reported some anonymous Westminster insiders, otherwise known as the Project Fear Press Office, who warn that the Scottish Government’s timetable for independence negotiations is a non-starter. It cannae be done, because there’s going to be a UK general election in 2015. We can’t possibly expect one UK government to be bound by decisions of a UK previous government because it breaches one of those unwritten rules of the British constitution that they’ve made up to suit themselves. It’s interesting that Project Fear is now acknowledging that a Yes vote is a real possibility. Couldn’t be anything to do with tomorrow’s publication of the long awaited White Paper which will set out a roadmap to a better Scotland, could it. Hope they tell us, always trumps fear. More on that soon, no doubt. It also explains the dearth of answers from Project Fear so far on what we can expect in the event of a No vote. Still the news that a UK government doesn’t have to abide by international agreements entered into by its predecessors does seem to clash with another of those unwritten rules that make up the British constitution. That’s the one that says an incoming government is bound by the treaties, contracts and obligations entered into by its predecessor. Otherwise they’d have had to cancel the London Olympics in 2010 when the Labour government which was awarded the games by the IOC was replaced by Coalition. I don’t recall many calls for tearing up all the Olympic negotiations and starting all over again at the time. Funny that. This latest scare story must fall into the “making things up as you go along” sections of Britain’s glorious unwritten constitution. You can appreciate why our political masters find it such a useful tool of governance. The latest problem to confront Scottish self-determination has all the hallmarks of one of those problems that can be solved by self help manuals with titles like Feel the Fear and Do it Anyway, which promises to help the reader “move from a place of pain, paralysis and depression to one of power, energy and enthusiasm.” Which not coincidentally is also a good description of the Yes campaign. The late great Douglas Adams described a security device based on somebody else’s problem in the Hitchhikers Guide to the Galaxy. The Somebody Else’s Problem Field worked just like the cloaking or invisibility devices in more traditional sci-fi, the difference being that the “cloaked” object remained very much in view. It was just that everyone ignored it as it appeared to be a trivial little piece of fluff of no importance or substance, and it was somebody else’s problem. There’s a similar device in the Scottish Parliament, where it’s known as Wullie Rennie. In this case the Field Generator is only functioning partially. We can see it’s somebody else’s problem, but we can also see that it’s Westminster’s problem. Holyrood will be responsible for who represents Scotland during these negotiations, Westminster will be responsible for the Westminster side. Are they really admitting that they’re incapable of forming a negotiating team? If that’s true why exactly would we want to stay in a Union with such a spectacularly incompetent government? A political crisis over the fate of institutions like the Bank of England, the UK’s national debt and its defences at the same time as a political battle over a referendum on Britain’s EU membership would be likely to cause a damaging backlash from the financial markets, investors and international lenders. A Westminster Government upsetting the financial markets just to punish Scotland? That’s too implausible a scare story even for Project Fear. As any true fan of the series knows, Dr Who is not a science fiction programme for kids. It’s a social realist documentary combined with a religious experience. But now, woe, woe and thrice woe, we must sacrifice John Barrowman to the Sisterhood of Karn (which, to be fair, could be a win-win), Scotland’s chances of independence have been sucked into the Rift in the Space Time Continuum that lurks beneath Cardiff. It’s keeping me awake at night. Curse you Project Fear! The most fearful of all futures awaits us. Esconced in a secret underground hideout – which bears a startling resemblance to a quarry in Wales – the evil genius Master Eck, ruler of the Cybernatrons, will be able to manage a feat that even the combined forces of the Daleks, the Cybermen and the Weeping Angels were unable to achieve: creating a dominion where even the Doctor cannot tread. Although the Doctor can cross space and time, can voyage to galaxies beyond the reach of the most powerful telescope, slips easily between one dimension and another, and can travel from the Big Bang to the end of the Universe, Project Fear insists that he won’t be able to cross the border into Scotland if we become independent. It will knacker the spacetime regulatory thingy in the Tardis, and the Gallifreyan RAC won’t go to an indy Scotland on account of the extra paperwork. So said Ruth Davidson, High Queen of the Lizard People, as she addressed a nation cowering in terror behind the sofa, watching from between their fingers. Scottish Tories have been trapped in a time vortex for decades now, so you’d think she’d be a credible witness. Wise Earthlings should heed her counsel, she used to be a presenter on the Gallifreyan version of Reporting Scotland – featuring Dalek exterrrminashuns, cute Schrodinger’s kittens, and fitba. Because no matter where you go in time or space you can never escape interminable reporting about 22 millionaires ruining a perfectly good lawn. It’s one of those immutable laws of physics, like the one that says you can give one billion Johann Lamonts one billion typewriters but even after one billion years they still won’t have managed to construct a sentence that makes any sense. Thankfully this latest scare story is definitely not bigger on the inside than it is on the outside, and you don’t need a sonic screwdriver to deconstruct it. It’s just a load of Ood pish even less plausible than an episode of Made in Chelsea starring Johann Lamont and Wullie Rennie. Which isn’t very intergalactic superheroey time traveller at all, but that’s what comes of confusing Ruth Davidson with the Tardis’s Data Core. The argument appears to go that because we’ll not be a part of the UK, we’ll no longer get BBC programmes. We’ll get rubbish Scottish programmes instead of the BBC’s rubbish interspersed with the occasional wee gem. While I’m prepared to concede that the great majority of telly output is indeed pish, and will remain so after Scottish independence, it’s unclear why Ruth believes that Scottish telly will be incapable of producing the occasional wee gem of its own. She’s a proud Scot but, not proud enough to think there’s anyone Scottish capable of producing a hauf watchable telly show. Like, oh I dunno, Steven Moffat who produces Dr Who. In any case, it is already established in the Canon of Doctor Who, in an episode penned by the very same Mr Moffat, that Scotland will become an independent nation. In the episode The Beast Below Amy Pond is trapped on a spaceship carrying the population of the UK to humanity’s new home on the other side the Milky Way. Earth had been ruined by idiotic governments with nuclear weapons. (We’re not pointing any fingers because that would just be rude.) With typical UK efficiency the space ship’s engines had died the death of a thousand austerity cuts. In part because they’d used the same design as the latest submarines based at Faslane. Amy was asked by another passenger what she was doing there when she had a Scottish accent. Amy asked why shouldn’t she be there, and where were all the Scottish people anyway. “Oh,” replied the passenger, “they’ve got their own ship.” One with engines that worked. The programme is almost as old as I am, the first Doctor I can remember was Patrick Troughton. The best was Tom Baker, and I will strangle anyone who says otherwise with a multicoloured scarf. This devotee of Dr Who, while cheerfully admitting to being a saddo git who really needs to get out more, has never missed an episode since. Even – and I’m not proud of this – the ones with Sylvester McCoy. My weekly religious experience has taken place every Saturday evening the programme was on, uninterrupted except by dogs jumping on the sofa and partners who unreasonably insist on speaking when you are communing with the Muse of Gallifrey. Worshipping at the shrine of the Tardis took place without fail, despite the fact we spent a decade and a half living in Spain, courtesy of a satellite dish perched on our roof and a generic satellite decoder giving access to the entire gamut of free to air UK broadcasting – all without a licence fee or a satellite telly subscription. Scotland is a lot closer to England than Spain, Scottish residents would not require the 2 metre dish we had, which allowed us to contact passing Sontaran Battlecruisers as well as watching the BBC, alongside an impressive range of Nigerian soap operas and shopping channels selling sonic kitchen appliances. A Sky satellite dish (already installed in many homes) and a 30 quid generic satellite decoder, or a slightly more expensive Freesat decoder, and the job is done. No need to take out a Sky subscription or to find a way of resolving temporal paradoxes. And as an added bonus it inverts the polarity of the fear beams from Planet Westminsteron. We get a reformed BBC, Scotland and rUK both contributing. BBC Scotland gets proper autonomy and a national channel. We pay the same licence fee. And we still get Dr Who. We get an independent Scottish Broadcasting Corporation which co-operates with the BBC on programme making and shares programmes. We pay the same licence fee. And we still get Dr Who. We get an independent SBC that the BBC will not co-operate with, instead the SBC buys popular programmes from the BBC on the international TV market. Meanwhile it can sell its own popular TV shows on the international market too. We pay the same licence fee. And we still get Dr Who. Or there will be no SBC because the new Scottish government won’t be able to organise one, for the usual reasons of weeness, poverty and stupidity. We install a satellite dish, get a cheap decoder, pay no licence fee. And we still get Dr Who. So even in the absolute worst case scenario depicted by Project Fear, and even assuming that the BBC boycotted the new Scottish Broadcasting Corporation and refused to sell it any programming, we’d still be able to watch Dr Who and the entire range of UK free to air broadcasting. No subscription fees, no licence fee required. The total one off cost comes to considerably less than a single annual UK licence fee. This makes Project Fear’s latest scare story all the more bizarre, because even if their outrageous lie did come to pass, we’d still get all the telly we wanted, and it would cost us less than we have to pay just now. Even Doctor Who’s famously huge intellect would struggle to wrap itself around the logic of that one. According to a recent study* by Croatian academic Dr Jaroslav Tir of the University of Colorado’s Department of Political Science, an independent Scotland could be one of the most pacific nations in history. It’s not that sort of pacific, Calmac ferries will not call at Tahiti en route to Rothesay. We’ll not be blessed with tropical sunshine, Gaugin paintings of Polynesian maidens, and hordes of Australians on weekend breaks. The kind of pacific that’s in store for us is even better – Scotland will be a country which is blessed by the prospect of peace, which will enjoy freedom from war, and experience exceptional democratic stability. This good news, which Dr Tir delivered during a recent conference at Glasgow University, was completely drowned out by Project Fear’s insistence that iScotland will be unable to protect itself against rampant hordes of Russian cybercriminals, god-botherers with bombs, and Faroese trawlerboats. We’re defenceless against North Korea drilling a hole through the centre of the Earth and dropping a missile though it so it can nuke Hampden in revenge for the flag incident. We’ll be a little lost country, shivering alone in a big bad forest full of foreigners with dastardly ways. Project Fear never stops to ask itself who we need to defend ourselves against, and why. In the James Bond universe of the No campaign, villains need no motive. They’ll act just like Westminster will after a No vote, apparently, and will punish us out of sheer spite. In essence, Project Fear’s campaign boils down to “Vote No or we’ll kick your arse, and while we’re kicking your arse, these other baddies will kick your arse too – for no reason other than we’re all basterts.” It’s understandable that they’re finding it difficult to put a positive gloss on this. But if the basterts are going to kick our arses anyway, I’d rather take my chances with a Yes. Despite the increasingly discredited and discreditable threats of Project Fear, Dr Tir’s work tells us that our chances of living a nice quiet life are rather better with a Yes vote. He has analysed the process of independence in many countries, and the factors that influence how peaceful the new state becomes. What he discovered is that there is a correlation between the peacefulness of the country’s independence process and the likelihood of that country becoming involved in wars. The more peaceful the independence process, the less likely it is that the new state will be belligerent and prone to getting into artillery exchanges with its neighbours. A nation that becomes independent peacefully develops into a peaceful state. The Scottish independence process is exceptionally peaceful. The worst that happens is that someone gets called a name, and even then the outrage is most often manufactured. It would appear that political violence in an independent Scotland will most likely consist of some politicians occasionally taking the huff over a supposed slight by some other politicians. The rest of us can live with that quite easily, unless you’re one of those peculiar people who loses sleep over Alistair Carmichael saying he’s been called a nasty name. However unpleasant being called a name is for the sensitive Carmichael, it’s a whole lot less life threatening than invading Iraq. The experience of living inside a goldfish bowl is very different from viewing it from the outside. For all the supposed bitterness and vitriol of the Scottish debate, the rest of the world holds us up as a model of how a nation can attain independence. But we’re inside the goldfish bowl, so all Scots independentistas see is Westminster gobbling all the fishfood and Ian Davidson doing a jobbie in the watter. Whereas Project Fear sees independentistas as a voracious carp which is about to swallow their political careers whole. Which admittedly isn’t entirely incorrect. But despite this, none of the fish in our bowlful of Loch Ness watter are killing each other. Our monsters are mythical. We’ve avoided cannibalism, headbutting, devouring our young. We’ve had no physical violence, not so much as a fin has been nibbled. Our piranhas are only metaphorical. As a nation, we need to give ourselves a bit more credit for this because it doesn’t happen very often. Our non-violent independence campaign is in itself proof of the democratic maturity of Scotland. The other major issue determining how peaceful and stable a country is going to be is them next door. Countries which can’t agree with the neighbours over where the garden hedge is situated are countries which are likely to spend decades fighting over the petunias. Here again, Scotland is exceptionally fortunate. If you’ve ever looked at a historical atlas, you’ll be struck by the ever changing kaleidescope of borders across Europe. From around the year 1000, Poland has waxed and waned, at times stretching across much of Eastern Europe, at other times wiped from the map. After WW2 it ended up pretty much where it started 1000 years earlier. It’s not just Poland. Across Europe borders came and went, populations ebbed and flowed. The end result was a whole lot of states which had claims on all or part of another country’s territory, and took a chainsaw to the hedge and trampled all over the neighbour’s vegetable plot. Scotland’s sole land border has been one of the most stable and enduring in Europe. For the best part of the past 1000 years it’s been in more or less the same position, give or take Berwick. Although Scots have emigrated in their thousands, there are no solid blocks of Scottish people in some other land, calling to be “reunited” with the hameland. Scotland has no territorial claims, and no other state has any territorial claims upon Scotland. What all this means is that Scotland is an exceptionally favoured country. It is a racing certainty that as an independent nation we will have few enemies, we will stay out of wars, our defence force will not sally from its barracks and overthrow the legitimate government, and the worst manifestation of political violence we’ll witness will be the weekly hurling of insults at Furst Meenister’s Questions. The alternative we’re offered is the almost continual war of the United Kingdom, “punching above our weight” in military conflicts which have nothing to do with us, and seeing future generations of young Scots going off to die in foreign fields. And we still get Johann Lamont’s weekly sneerathon. * Unfortunately Dr Tir’s original research doesn’t seem to be available online. I’m afraid updates to this blog will be a bit erratic over the next week or so as my partner has been admitted to hospital for tests.